Circle C Milestones is a book series written by Susan K. Marlow. Thick as Thieves is the first book is in the Circle C Milestones series which is the 3rd Andrea Carter series. All of the series are based in the late 1800’s in California and are as far as I can tell, historically accurate. Circle C Beginnings is for ages 6-9, in these books Andi is about 8 or so and dreams of owning a horse. This set of books is based in 1874. A few years ago my girls read this entire series of 6 books and loved it. Circle C Adventures is for ages 9-14, in this set Andi is about 12 and is based in the 1880’s. We haven’t read any of these, yet. Circle C Milestones is for ages 12 and up, in this set Andi is 14 and deals with some drama as far as friends, and raising horses. 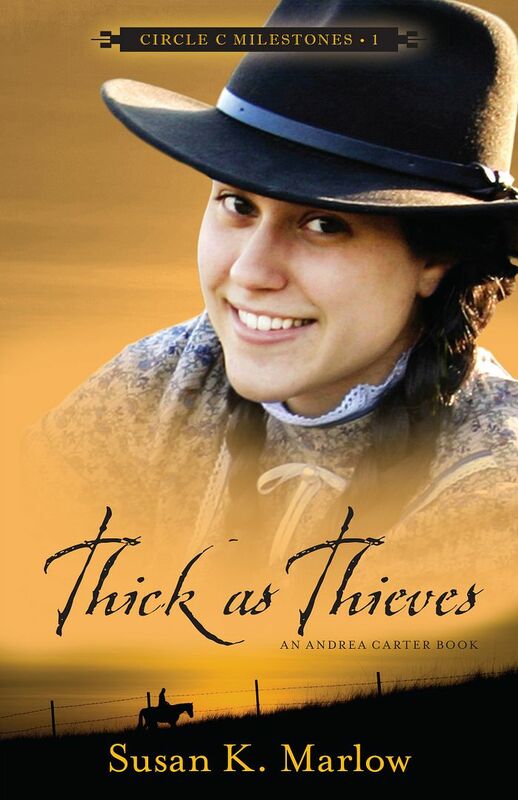 Thick as Thieves is about Andrea’s (Andi’s) life on the Circle C Ranch. She is still raising her horse, Taffy, whom is foaling. Taffy is the horse she received in the very first set of Andi Carter books. Andrea is in school even though she would rather be spending time with her horse and the foal. To make matters worse she is assigned to be seatmates with a girl who Andrea doesn’t get along with. Then when the cattle rustlers come to town and target the Circle C Ranch, Andrea doesn’t have anyone else to turn to but her new seatmate. Will she help her and even more important, can she trust her? The theme of Thick as Thieves is FRIENDSHIP! One really neat thing besides the great storyline and writing behind all three of these progressive series’ is that Susan K. Marlow includes free study guides with all of these books. These study guides are age/ developmentally appropriate and match the levels that the corresponding books are written for. The study guide for Thick as Thieves has 6 lessons that are chapter based. Each lesson covers approximately 3 chapters. However you can use the study guide as you go, or read the entire book and then go through the study guide after. The study guide includes things like vocabulary, fill in the blank, multiple choice, crossword puzzles, science (about foaling and lice! ), math (Are you smarter than an 1880’s 8th grader? ), writing, venn diagraming, history (about cattle rustling, dime novels) and so much more. We decided to read the entire book and then do the FREE activity guide. By the time we got to the activity guide my girls were not really interested. They already knew how the story ended and were not interested in the activities. It would have worked better for me if we did the chapters and study guide intertwined. They would have had more interest to do the worksheets in order to move on to the next read. I just wasn’t able to motivate them enough. I am a huge Susan K. Marlow Fan. My kids have loved many of her books. We even have some from her Goldtown Adventures series (for boys). Her books have always delivered. The work she puts into the study guides is nothing less than amazing. The Thick as Thieves book and study guide held up to the very high standards that we already had Susan K. Marlow set at. Thanks, Alyson, for your sweet review. I'm so glad you all enjoyed the book.